when pushing this far south. Given optimal ice conditions, we aim to sail south of the Antarctic Circle. A favoured landing site here is Detaille Island, home to an abandoned British science hut. ‘Base W’ was established in the 1950s and is in a remarkable state of preservation. For the history buffs this is a fascinating place, providing a glimpse into the harsh life of early Antarctic scientists and researchers. This far south, we are always at the mercy of prevailing ice conditions. Years of experience pushing this far to the south, indicates that late February gives us our best chance of reaching Marguerite Bay. We may take the ‘shortcut’, through a narrow channel known as 'the Gullet' if the passage is ice-free. Otherwise, we could navigate around the outside of Adelaide Island - which will take more time, yet bring us to the same destination. Marguerite Bay is home to several important science bases - Rothera (UK), San Martin (Argentina), Carvajal (Chile). We hope to make a visit to at least one of these locations. The area is full of history and the British Graham Land Expedition (BGLE) of the early 1930s - led by intrepid Australian explorer, John Rymill, established their southern base in this area. They explored and surveyed large areas of the Antarctic Peninsula by airplane, establishing the Antarctic Peninsula was indeed connected to the main continental landmass - and not just a series of offshore islands as earlier believed. 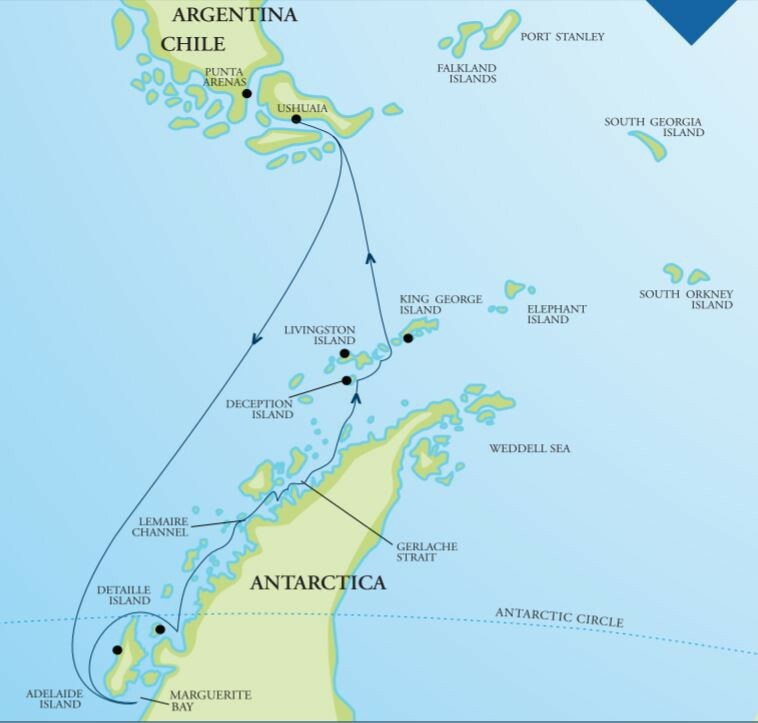 This vicinity marks our turnaround point and from now on, we cruise in a northerly direction exploring the dramatic coastline of the Antarctic Peninsula. There are several locations in the Fish and Argentine Island archipelagos which allow for Zodiac cruising and potential shore landings. We hope to visit a working scientific base to learn of the important climate-related research happening here. A hike over the snowy saddle of nearby Winter Island allows us to stretch our legs and explore the old British Antarctic Survey hut. Petermann Island is home to a sizable Adelie penguin rookery. Adelies - the smallest of the Antarctic penguins nest here and share the location with Gentoo penguins and Imperial cormorants. The view to the north of Mount Shackleton and Mount Scott is impressive. These towering granite sentinels mark the southern entrance to the Lemaire Channel. Nearby Pleneau Island offers more opportunities for shore landings. Just off shore, in the shallow waters of the Penola Strait, massive icebergs run aground. Constant wind and wave action sculpt these gargantuan chunks of ice into fantastic shapes, revealing more shades of blue than you could ever imagine. For many, a zodiac cruise here will be a highlight of the voyage. We aim to transit the Lemaire Channel on our way north towards Paradise Harbour. This may be the first opportunity to step foot on the continent of Antarctica proper. Nearby Neko Harbour offers another continental landing. Both locations offer terrific hiking opportunities up to panoramic view points. Expect to be in full sensory overload by this time of the voyage. The good news is, our adventure is not over and we still have several days of exciting exploration ahead. Orne Harbour is another spot we hope to visit and the hike up to a rocky knoll provides great access to a chinstrap penguin rookery and jaw-dropping views over the Gerlache Strait. At Cuverville Island, there is a large Gentoo penguin colony which we observe at close quarters. Leopard seals are often sighted cruising the shallows along the landing site. For the kayakers, a full circumnavigation of the island is a real possibility. It is somwhere in this vicinity we hope to spend a night ashore camping if weather conditions permit. We have all the gear and an expert team to make this unique experience happen. We are now at our most northern point on the Peninsula. Additional visits may include Mikkelson Harbour or nearby Cierva Cove, rounding out what has been a comprehensive exploration of the Gerlache coastline. Tonight, leaving the continent in the soft twilight, we reflect on an incredible 10-days of exploration south of the Circle and the Antarctic Peninsula. Having crossed the Bransfield Straight overnight, we arrive in the South Shetland Islands. The adventure is not over and if the weather conditions allow, we sail the ship into the flooded volcanic caldera at Deception Island. This is a very dramatic place and history is all around us as we explore the old whaling station, with the rusted old boilers and dilapidated wooden huts. At the far end of the beach is an old aircraft hangar. This is where Australian, Sir Hubert Wilkins made the very first flight in Antarctica in 1928. There is also an outstanding hike here, high up onto the rim of the crater. On a sunny day, cruising along the coast of Livingston Island is a memorable experience. There are several other landing sites in the vicinity including Half Moon Island, or the broad pebbly beach at Yankee Harbour, where we sometimes encounter Weddell seals sunning themselves. This is another great spot for a hike or a Zodiac cruise.